A new Q&A thread for the Chinese launchers. I'm searching for information about the CZ-2D Chang Zheng-2D launch vehicle. The CGWIC gives some figures about this launcher but other sites give other distinctive numbers. Does anyone has some trustworthy numbers for the CZ-2D vheicle characteristics? There are two many parameters. Tell me which are the main parameters of your interest. I can dig it out for you. The main parameters I have for the CZ-2D are the following. Are they correct? There is also a streched version of the CZ-2D. What are the main differences? The CZ-2D is a two-stage, liquid-propellant launch vehicle designed mainly for Low Earth Orbit (LEO) missions, with an LEO payload of 3,700kg. 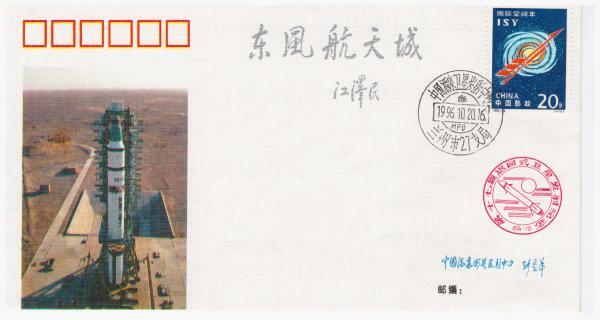 A total of 10 launches were carried out between 1992 and 2008, all from the Jiuquan Satellite Launch Centre. The CZ-2D is generally carries UDMH/N2O4 for all stages. The first stage uses a YF-21B motor consisting of four 65,000kg-thrust YF-20 chambers motors with swinging nozzles. The second stage has a YF-24F rocket motor consisting of one 75,000kg-thrust YF-22B main motor with fixed nozzles, and a YF-23F swivelling venire motor with four chambers motors that produce a total thrust of 4,700kg. The launcher also features a McDonnell Douglas (now Boeing Aerospace) PAM-D upper stage providing 66,700 lb of thrust. The ChangZheng 2D is available in two versions: Type A with a 2.90m-diameter fairing and Type B with a 3.35m-diameter fairing. 1. 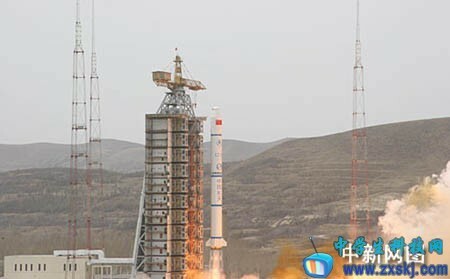 Is it true that from now on all comsats launched by China will be launched on a CZ 3B/E rocket? 2. Does anyone have any specific information on the CZ 4C's third stage? Like number of chambers, thrust, burn time & lsp? And what are the main differences with the CZ 4B's third stage? About the CZ 2D, CGWIC says it has a YF-21C engine on the first stage and YF-24C on the second stage, Sinodefence says YF-21B on the first stage and YF-24F on the second stage. Which one is right? I'm looking for CZ-2E images, mainly any images related to the January 25, 1995 Apstar-2 launch failure. Found this videos on YouTube... I think that on the second video we can see the CZ-2E (Y1) launch pad abort on March 22, 1992; the January 26th, 1995 CZ-2E (Y6) rocket crash; and the St. Valentins massacre on February 14th, 1996 with the CZ-3B (Y1) launch vehicle. Is it possible to identify when this two CZ-2C were launched? Zhang Guitian (Apparently a Chinese "acamedician") was talking at a conference in 2006 referring to Chinese plans to build something on the scale the UR-700M. Does anyone know more about this/able to verify/dispel it? Or know where it was discussed on another thread? Rui, not a definitive identification of the launches. But I found some images which maybe give some hints. The first image shows maybe the second truck which transports the first stage. 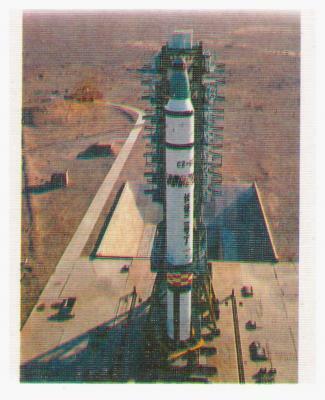 A launch vehicle number is seen - Y802302 (?). The second image is from a philatelic cover which commemorates the first commercial piggyback payload. The brown smoke plume at the first stage seems to correspond with those of the very left image in the launch sequence. Finally an image from the August 1988 launch. would anyone be able to share any information regarding the (assumed) foam insulation of the cryogenic CZ-3(A thru C) third stage? Of interest is (a) is it bonded on foam, ala the Ariane 1-4 third stages, or sprayed on foam, ala the Delta IV stages, (b) is it exposed or covered with MLI (as on some Centaur stages), (c) are there any good photos of the foam, perhaps during application, finishing, painting (? ), etc., and (d) are there published or known designation(s) and physical characteristics, principally the mass density, of the foam? If my supposition of foam is incorrect, clarification would be welcome. Are the Chinese rockets still manufactured in two locations; SAST still look after the CZ-4 and CZ-2D? What about the engines. And who makes what for the CZ-3 rockets as both CALT and SAST are involved? CALT (Beijing) designed and produced CZ-3 third stage (LOX/LH2) while SAST used to build first and second stages. limen4, that is not the picture of the 1988 launch. In the 05 Aug 1988 launch the spacecraft was of a Jianbing-1A type, i.e. a longer cylindro-conical one, such as in a well-known 1992 launch with Freja. But in the picture we see a typical conical Jianbing-1. I've found seven other images of the launch in question (more than any other!) but I still don't know which launch it was. Here is another question on CZ-2C. (3) The current version of 233 metric tons flown since 2004 (10 vehicles) with stretched first stage, actual payload of 3900 kg. In the upper photo, first stage from the lower blue ring to the interstage struts is equal to 3.5 levels of service structure, the second stage is another 2.5 levels high and the payload shroud is almost two levels more. In the lower photo, first stage is definitely four levels high. 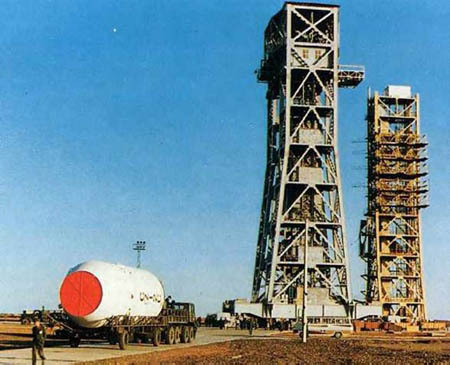 First, the launch record omits the launch failure of November 1974. My understanding has always been that the November 1974 launch failure plus the FSW launches of 1975, 1976 and 1978 all used the original CZ-2 aka CZ-2A launch vehicle, with the 2C only being introduced in 1982. Note that in Stan Black's listing the 1982 CZ-2C is "Y1", indicating the first flight. Looking at the CZ-3B entry, I see that the differences between that and the CZ-3B/E are in the strap-on and first stage propellant masses: the second and third stages are identical. CALT is known to attribute it to CZ-2 and all launches since 1975 to CZ-2C while CASC lists CZ-2C launches from 1982 only -- which makes more sense in my opinion even if the 1982 version differs from 1974/75 only in uprated engines. I believe Stan Black's list inherits from a long http://www.9ifly.cn/thread-407-1-1.html topic at the Chinese forum www.9ifly.cn. Several CZ-3 numbers are still educated guess AFAIK but others has been confirmed by Chinese sources and documents. Short and full numbers are known for some vehicles -- for example, Sven Granh's FSW-14 was launched by CZ-2C number Y903210 or Y10 for short, and the Y802302 = Y2 vehicle pictured above was intended for 19 Aug 1983 launch. By the way, we known the Long March 3 name since 1979 but when exactly Long March 1 and Long March 2 names were announced? When did it become known for sure that FB-1 and CZ-2 both existed? I found that both CZ-2 and CZ-2C names were known by January 1986 but when exactly CZ-2C was identified as the two-stage vehicle used in certain FSW launches? To add to this discussion, here are two tables extracted from CGWIC "LM-2C" leaflets respectively published in 2009 and 2011. There are indeed differences in the various lengths..
Input~2, thank you for the tables. It's very interesting to see even larger estimate of current CZ-2C launch mass, 245 metric tons. Don't know if this version has been already flown. As usual, there is conflict within and between the two tables and the plain logic. One meter of CZ-2C tankage length with 3.35 m diameter is equivalent to 8.8 m3 of propellant and -- for UDMH/N2O4 -- to 10.5 tons of load. So when launch mass goes from 233 to 245 metric tons, you may expect stretching the vehicle one meter or so (which is indeed shown in the table) in either stage or both. Again, the first stage load supports the total mass increase but the stage lengths do not conform with other data. It seems that stage length is the less reliable parameter in such tables. Yes of course there is no guarantee that the image on the philatelic envelope shows really the Aug 5th 1988 launch. But Jianbing-1 (FSW-0) and Jianbing-1A (FSW-1) had the same design. As far as I know, only the camera system was changed for mapping purposes. The new spacecraft design you mentioned was only introduced by Jianbing-1B (FSW-2). In case of Freja a cylindrical adapter was added to the FSW-1 to accommodate the Freja payload. My conclusion is that the image on the philatelic envelope could show the Aug 5th 1988 launch. I upload images of the FSW-1-payload used for the Aug 5th 1988 launch (a copy from a sticker) and the arrangement of Freja and the corresponding FSW-1 payload. Enclosed the philatelic envelop I also found a (very bad) b/w copy from a Remin Ribao newspaper cutout, which shows the launch on Aug 5th 1988.
limen4, thank you! Now I strongly believe you are correct. By the way, launch time in Renmin Ribao is given as 16:30 Beijing Summer Time, now abandoned. That is a very good source of information, which I tried to make more accessible to people on this forum. From what I learnt I found references to CZ-4B Y14 for Haiyang-2. I’ve re-visited previous post on this forum and I cannot find a fourth version. Found a mention of the 245 ton version in a Chinese source -- Taikong Tansuo 2007 #8. Unfortunately no more details in the text. 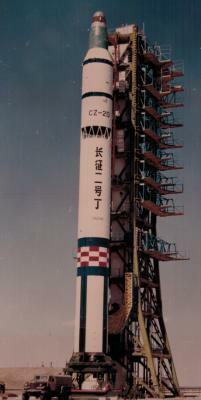 In 1978, the Long March II rocket, based on adaptive technologies through improved design, developed a new launch vehicle - the Long March II C. Rockets for about 40 meters, the satellite fairing diameter 3.35 m, take-off mass 245 tons, carrying capacity of near-Earth orbit 2.5 to 3.9 t.
The launch of the "Long March II C" carrier rocket length 41.9 m, take-off mass 245 tons. From the pictures above, I'd said that the shroud and second stage are identical but the first stage is some 2.5 meters longer (and have fins of course). 2.5 meters layer of propellant is some 26 tons of load. Adding tankage mass and fins we'd probably have 2 more tons. Seems to be generally compatible with total mass increase of 213 to 245 tons rather than to 233 tons. More detailed image of the newest vehicle may provide for more accurate estimate. So the 162 fuel load figure, and 213 lift-off mass are misleading? The 172 and 55 ton fuel loads are compatible with durations of engine burns for SJ-11-03 launch which are barely visible in launch center photos. I'm still confused about the SD, SM and SMA kick stages used for Iridium, Tan Ce and HJ-1A/B - lots of different versions of mass and size out there. One stage has 2620 kg propellant 309 kg dry (described in a paper at IAC 2004) - I gather this is the Tan Ce's SM? One is apparently only 22 kg propellant - is this the SMA? And the SD had a motor which was 125 kg prop 33 kg dry but probably 550 kg total dry for the stage (rather than just the motor). Clarification and confirmation would be welcome. This is what I believe the correct pairings of stages for the current versions of Chinese launchers (as of 2012). Note that I'm using the notation first used on the Ariane family to describe the amount of propellant on each stage when fully fueled. The items in bold are those that are uncertain. Any comments? Booster stage of CZ-2F (2011 version) = L4? Very interesting! Thank you Galactic! Also, is the rocket on the right (on infographics) LM-5? I think so, according to numbers, but not sure. Will it use liquid propellant boosters, or not yet known? Someone has posted a Chinese paper that resolves all configuration discrepancies between the different rockets of the CZ-3A series. CZ-3B/G2 and G3 corresponds to what we call the "CZ-3B/E". CZ-3B/G3Z - enhanced CZ-3B with the 4.2 m diameter 4200Z fairing and extra RCS tanks and thrusters on the 3rd stage, probably for extra-long coast missions. May debut on the Chang'e 3 launch later this year. GTO capability 5.2 tonnes. CZ-3C/G3Z - CZ-3B/G2 minus two boosters. GTO capability 3.7 tonnes. Maybe someone can help to check which launch uses the sub-variants as described above? We should create a pinned topic that lists all of China's launchers (Past, Present, and Future) with their associated launch pads so that way people do not have to keep asking in a new topic every time everyone forgets that one exists. Copy that! That's a good idea! I'll work on it. All help will be welcomed! With the second LM-11 launch possibly coming in this month, I wanted to look up some more information about the LV. The result was pitiful. Could the limited publicity have anything to do with the LV possibly having technology and part commonalities with the DF-41 ballistic missile which is still under active development? I believe that CZ-11 may be based on the DF-31 series solid fuel ballistic missile already in China's inventory. The canister used to launch CZ-11 was similar to launch canisters used by the road-mobile DF-31A. That was my first thought too (DF-41 is also much bigger than it). Thanks for the prompt reply. The rocket is 2.2m diameter, the same as the DF-3/CZ-1 and as the CZ-7 strapons. But those are CALT products I believe, and I expected the KZ-11 to be a CASIC product (as opposed to CALT's CZ-11) since the marketer Expace is a CASIC subsidiary. Anyone got an idea what the KZ-11 is based on? ......and I believe KZ-11 is all solid as well so nothing to do with the rockets above. which I understand is a CALT/ARMT product. It's probably a new design, especially since IIRC it uses carbon fiber casings (which reminds me that I need to translate all relevant materials on the KZ series to here soon....sigh). and a 2013 cost of $70M for a CZ-3B (SpaceNews website, "China Great Wall Reaffirms Commitment to $70 Million Long March Launches"). The rest eludes me. Any help would be appreciated. The second author (Long Lehao) was the chief designer of CZ-5, so information here is very credible. Heh, I saw that yesterday and I still don't have time to summarize it! I'll do that later today. There is a list of orbital launches there. Figured out most of the fields (please correct me if wrong) except the two fields coloured red. What does those two fields represent? I guess the second one is the launch timing, but what is the format...can't figure it out. Btw, the (factory serial no.) is something i just made up. Another thread describe this as a factory number/serial number. What would be the correct descriptor for this number? Julian Day or JDay (000 to 366) then Hour (00 to 23) then Minute (00 to 59) then Second (00 to 59) then Millisecond (000 to 999) Then ZULU Time (UTC) or LOCAL Time. That is DDD:HH:MM:SS.MS ZULU or JD: 000:00:00:00.000 ZULU (alternate precise short format is 000:0000:00.000 ZULU). My browser alarms me that the 9ifly.cn forum is now regarded as a Reported Attack Page. Is there a real threat? The CZ3B/YZ1 is also a CZ3B/G3Z/YZ1? 长征三号乙改三Z型/远征一号? We all remember the Long March as a crucial moment in pre-1949 Chinese communist history because Mao Zedong and the Chinese communists saw the march as a sign how they could persist in the face of attacks by the Kuomintang. However, I've wondered why almost all Chinese carrier rockets are named for the Long March. Does anyone know who first suggesting naming China's rockets in honor of the Long March? Its been a while since 2013 but there is reportedly development complete G4, G4Z, G5, and G5Z versions of CZ-3B and CZ-3C. CZ-3A upgrade programme appears to be frozen and possibly cancelled. Skyrocket has a reference to the standard G5 versions on his site but not much is known about the new versions. Two interesting photos posted on 9ifly. No info available. Serial number is 1901H, so it is the first CZ-2D produced in 1991 and launched in 1992. That was on 9.08.1992 (1992 Aug 9) with a FSW-2 satellite. Another image of the same launcher from a souvenir enveloppe. I guess that the pictures were made during a launch excercise in 1992. However, I've wondered why almost all Chinese carrier rockets are named for the Long March. Does anyone know who first suggesting naming China's rockets in honor of the Long March? Here is the official explanation, but in Chinese. Basically it was suggested by the designers and approved by the leaders. The Long March 1 project started around the eve of the cultural revolution, they had very limited options naming it. Cannot use historical or mythical figure. East wind, red dawn is everywhere. Quoting poems of Mao seems a safe choice. Not all Chinese launch vehicles are called Long March. Feng Bao (Storm) was developed by Shanghai. It was a part of the power struggle between Beijing and Shanghai. Shanghai lost, so Feng Bao was no more.